ABC Appliance Service is a division of A Action Appliance Repair. We service all of Connecticut and parts of Massachusetts and Rhode Island. Our appliance technicians are licensed, insured, and professionally trained to provide you with quality service — 100% satisfaction guaranteed. We are locally owned and operated, so when you choose ABC Appliance Service, you’re supporting your community. Our technicians live in the towns they serve, and our headquarters is located right here in Connecticut. With over 150 years of combined experience in the appliance repair industry, there’s no problem we haven’t seen! Our technicians continue to stay up-to-date with all the latest appliance technology and education. We provide a full year warranty on installed parts and a 90-day guarantee on all of our service and repair work to ensure that you are completely satisfied with our work. We know what parts we need to complete a job the first time. With one of the largest part stocks in the industry, we keep our vans fully-stocked which means we can often complete the repair in as little as one visit. 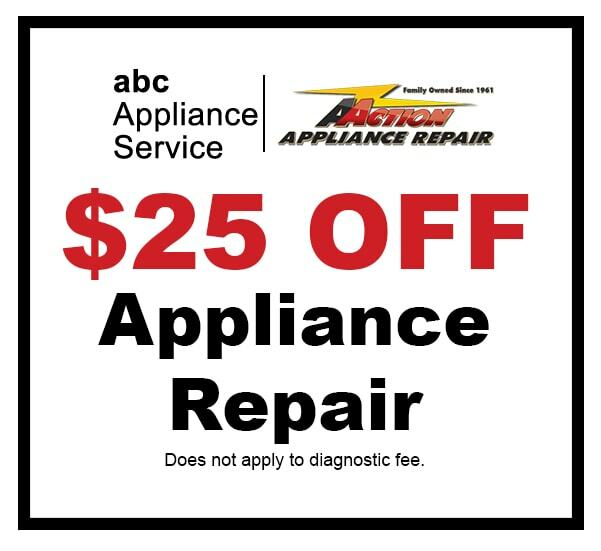 Be sure to take advantage of our $25 Off Repair discount for new customers. You can sign-up for our Preferred Customer List here.